The extended periods of diarrhea, vomiting, or both, that can occur with inflammatory bowel disease (IBD) may lead to dehydration. Dehydration occurs when more water is being lost from the body than is being taken in. The symptoms of dehydration can often be treated at home, but the problem can become serious if left untreated. If you have a significant amount of fluid loss from diarrhea, vomiting, or sweating, and you are experiencing other symptoms such as cramps, seek medical treatment right away. In the case of someone who is dehydrated and having symptoms confusion, dizziness, or fainting, the situation could be an emergency, and you should call 911. Preventing dehydration can, at times, seem like an uphill battle. The best way to keep hydrated is to drink at least 64 ounces (about 2 liters) of water every day. Caffeinated drinks such as tea, coffee, and soda pop, as well as alcoholic drinks, should not be added into this daily total. In fact, caffeine and alcohol can actually contribute to dehydration. Dehydration includes not only the loss of water from the body, but also the loss of electrolytes. Sports drinks or energy drinks can be very effective in replacing lost sodium and electrolytes quickly. To avoid nausea and to get the best results, all fluids should be sipped slowly. Drinking too quickly could lead to discomfort or vomiting. Avoid any sports drinks that contain additives such as caffeine, which may not be helpful. If a dehydrated person has very severe pain or a fever of 102 degrees Fahrenheit or above, a doctor should be contacted immediately. It may be necessary for a severely dehydrated person to receive fluids intravenously (injected into a vein) in a hospital emergency department. Loss of fluids is a special problem for people who have had their large intestine (colon) removed, and now have an ileostomy or a j-pouch. One of the main functions of the large intestine is to absorb water. The small intestine does, over time, "learn" to absorb water to some extent, but it is not going to be the same as having a large intestine. It is important for people with these types of surgeries that remove all or part of the colon to drink plenty of water every day. If it's unclear as to how much water is necessary, check with a physician to get a daily goal number. The best way to avoid dehydration is to keep up with your daily health-care regimen and drink enough water to stay hydrated. Some common sense about getting overheated, how much to drink and when to seek treatment for diarrhea is also helpful. Don't spend long periods in the sun without drinking plenty of water. Don't wait until you're thirsty to start drinking; thirst is a sign of dehydration. Drink at least 8 glasses of water per day. If diarrhea continues for three or more days, call a doctor. Sip water constantly throughout the day. When flying, drink plenty of water and avoid alcoholic beverages. Iowa State University Extension. "Fluids." Iowa State University 2015. Vorvick LJ. "Dehydration." A.D.A.M., Inc 8 Aug 2013. 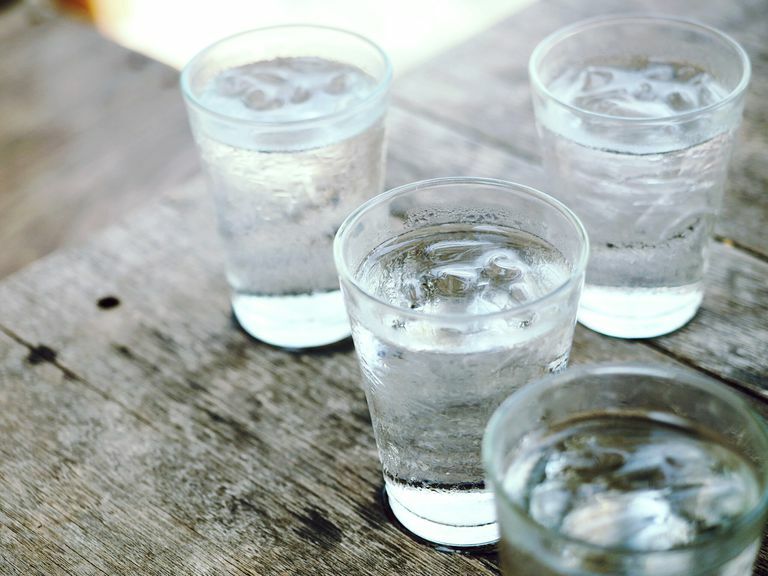 What Should You Do If You Have IBD And You're Dehydrated? How Will You Know if Your IBD Is Flaring?